As I was searching to find some nice movies, I accidentally bumped into an Australian production Last Dance. Interestingly, this 2012-released movie happens to be one of the critically acclaimed flicks with a power packed performances from two of its lead characters. Dealing with a provocative subject matter, the understanding between Jews (Israeli) and Palestinians, the film throws light on the human side with compassion and benevolence. It talks about two people which are separated by culture but compassion brought them together. 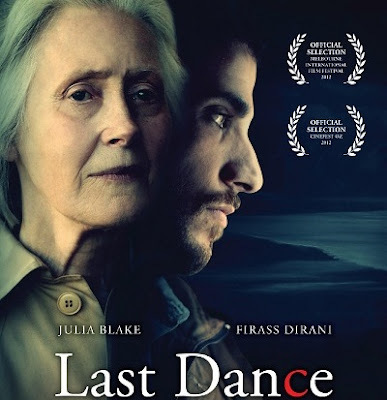 Last Dance is a low-budget hostage drama where a Jewish widow Ulah (Julia Blake), who lives near a Melbourne synagogue, just been bombed by two terrorists, is taken hostage by one of them in her own apartment. The wounded Palestinian terrorist Sadiq (Firass Dirani), who is in the run after surviving that bombing, holds the lady hostage until other members of his outfit come to pick him up. What follows is an intense talk between the Islamic terrorist Sadiq, who considers himself as a legitimate soldier in the name of God, and an elderly Holocaust survivor who finally tries to help the wounded captor without considering the nature of the crime and the fact that they are natural adversaries. The story actually takes off steadily when Sadiq’s condition worsens and his comrades didn’t show up. Even when he was unconscious Ulah did not try to call the police instead takes care of Sadiq’s wound and nurses to his recovery. Director David Pulbrook very intelligently kept the plot confined to the two leads and their life, while putting some of the important topics of race, religion, hatred and international politics to the audiences to ponder over. With this film, he certainly did not try to leave any comment rather it was more of an attempt to show the human side of any such conflict. As Ulah, Julia Blake gives a candid performance and so as Firass in portraying the character of the terrorist in an effortless manner. The film, in fact, never tried to focus on any kind of conflict rather promotes the essence of human civilized traits out of war and hatred feelings.